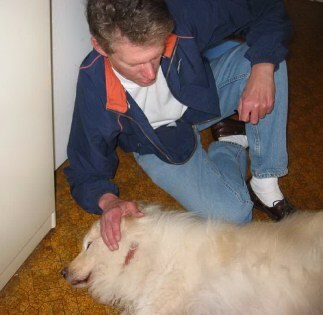 Yukon was most definitely Paul's dog and protector. He would whine if Paul was even out of site. Although he was fiercely loyal, I was always a far distant second. Yukon always hated his vet, Dr. Bixler, but Jim never gave up trying to make friends with him. Also, chasing the mailman away was a daily occurrence. Yukon could smell him a mile away. This picture of Yukon was always one of my favorites. He sure has his Sammy grin. 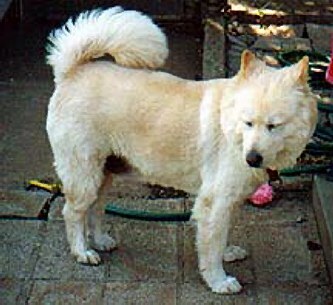 Yukon suffered from hip and spine problems for years because of being hit by the car. 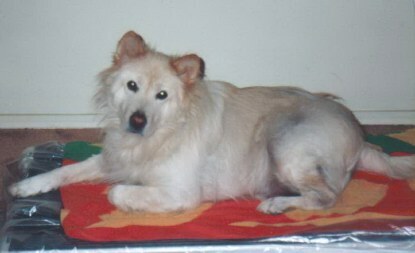 Although Rimadyl has gotten a bad rap by causing liver problems in some dogs, it was a lifesaver for Yukon, probably adding several years to his life. Yukon always loved the snow, here is one of my favorite pics of him with Paul. 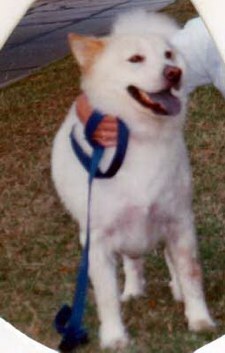 But his pain had suddenly become too much to bear, so on March 31, 2003, beloved Yukon left this life to join PD running through the fields and chasing mailmen to his hearts content. Yukon knows his favorite humans were with him at the end: Paul, Cheryl, Carl, and Donna. Godspeed Yukon.